The Mid-Atlantic Road Racing Series (MARRS) held its eighth regional SCCA Club Racing event of the 2012 season on Saturday July 14th and Sunday July 15th at Summit Point Raceway in Summit Point, WV. Dissimilar to previous MARRS races in 2012, Larry, Bob and Ted Cahall all practiced on Friday for the first time this year. For the actual races, Ted again ran in three classes: SM, SM5, and STL. Bob and Larry each ran in the SM and STL classes. The run group order for this weekend was: STL, SM5, and then SM. This was a unique weekend for Cahall Racing. Bob had a brand new crate motor, Larry had a "new" (to him) car after totaling his car the previous race, and Ted hired a racing coach, Todd Lamb, to help him improve his SM skills and sort his car out. On Saturday, for STL, Ted qualified 1st, Bob 6th and Larry 8th. Todd Lamb qualified 2nd with a 1:28.288 using Ted's SM car to help sort out suspension issues. 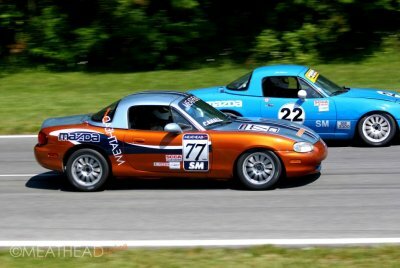 For SM5, Ted qualified 5th with a 1:26.095 - a new personal best for his MX-5. For the SM race, Ted qualified 14th with a 1:29.164 (best this year but still pathetic), Bob 22nd, and Larry 23rd as they each sorted out their new motors and cars. In the Saturday Qualifying Races, for STL, Ted took 2nd, Todd 3rd, Bob 5th, and Larry 7th. Todd ran a 1:28.570 again proving the SM car was faster than Ted could produce. :-( For SM5, Ted took 4th place. In the Saturday SM race, Ted blew his transmission with two laps to go and took a seriously pathetic 20th place finish with Bob and Larry both struggled with 22nd and 23rd place in a 23 car field. Overall a very poor showing for Cahall Racing as all three brothers sorted out car issues. Sunday brought some good news and some additional issues. Ted won the STL race after staying in front of the Acura that had beaten him on Saturday. Todd took 3rd while continuing to sort out the SM car with a 1:28.398. Bob took 6th and Larry 7th in an 8 car field. Ted again took a podium finish with third place in SM5 and set a new personal fastest lap: 1:25.787 (which was the second fastest lap by any driver in the SM5 race). For SM, Larry decided to sit out the session and let Todd begin to sort out his SM car. Bob finished 17th and Ted was involved in an accident in turn 1 that ended his race a few laps early, earning him a 19th place finish in a field of 22 cars that started. An abysmal weekend in SM for Ted.